We’re huge fans of books in our house. Brian and I both grew up loving to read, and we’ve virtually run out of space for books on our shelves. It was important to us to instill a love of books in our children, and it’s always one of my favorite times of the day when we’re all four settled in to hear a good story. It makes sense, then, that I was really excited when I heard about World Book Day. World Book Day is a celebration! It’s a celebration of authors, illustrators, books and (most importantly) it’s a celebration of reading. In fact, it’s the biggest celebration of its kind, designated by UNESCO as a worldwide celebration of books and reading, and marked in over 100 countries all over the world. It’s most dominant in the UK and Ireland, and is not currently in the US. How fun does that sound, though?! 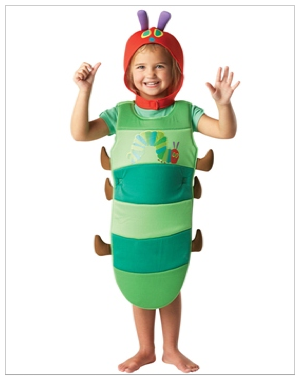 Kids can wear World Book Day fancy dress up clothes like the Very Hungry Caterpillar (from Fancy Dress Ball) to participate, and can get free books. I love this, and hope one day it comes to the US too! For one thing, it promotes books, and for another, it gives kids another excuse for dressing up (my boys have been ready for Halloween since, well, November 1). I do know some schools have celebrations – for instance, my boys’ day care is celebrating Dr. Seuss week and is having parents come in and read. Have you or your kids participated in any sort of book events? I’d love to hear about them! Before having kids, I don’t remember really ever paying attention to ingredients in products too much. Wow, did that ever change once our babies entered the picture! BPA in plastics, corn syrups in food, chemicals in toiletries – you name it, it seemed like there was something to worry about. It’s become really important to us to have our kids eat naturally, and for us to use natural products with them whenever we can. If you’re like me, you probably remember using Johnson’s baby shampoo when you were younger. That yellow bottle was a staple in our house when I was young, and then again when my brother was born. Well, Johnson’s has a line called Johnson’s Natural, which I’m really excited about. It’s the same brand I know and love, with 98% natural ingredients. I love that the baby wash is foaming, and the scent of all three products is great; it’s awesome to me that you don’t have to sacrifice anything by using a natural product. How does your family go natural? Share below in the comments – I’d love to hear! 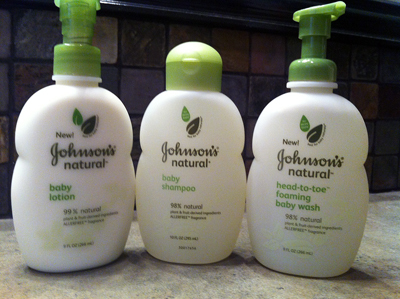 Note: I wrote this review while participating in a campaign by Mom Central Consulting on behalf of Johnson’s Natural and received a product sample to facilitate my review, and a promotional item to thank me for participating. Wow, it’s been months since I’ve participated in this. Can we say scattered, much? That’s not to say I haven’t been doing some planning here and there, but not as organized as I’d like to be. My two-year-old is sick today, which is awful (seriously, sick kids are so pitiful!) but I did take advantage of time sitting with him this morning to plan out meals for the week. Now, grocery shopping still has to take place today because of how crazy our weekend ended up being, but at least I’ve got some sort of plan in place! 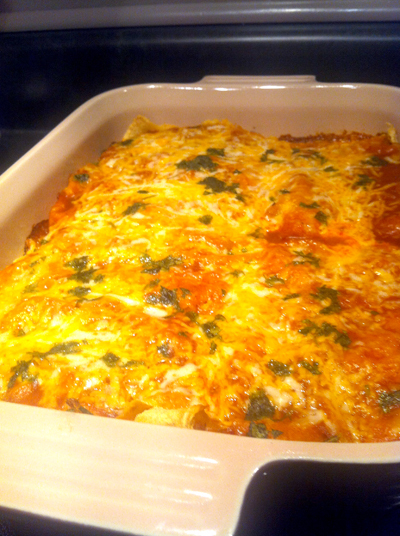 Monday: Leftover shredded chicken enchiladas. We tried a new recipe I found via Pinterest. Ours didn’t turn out nearly as pretty as the example (how on earth do you keep corn tortillas from cracking?) but they tasted good and we enjoyed trying something new. If we make them again I’ll add minced jalapeno for some heat, and a little sour cream for some tang. Tuesday: Chicken Parmesan & Easy Parmesan Risotto. Yup, that’s the upside to working from home with a sick child – Food Network is inspiring. The Barefoot Contessa featured a “risotto” that you bake in the oven, taking away the need to stand at the stove stirring for 45 minutes. I’m so curious if this will live up to our standard risotto recipe. Now, my “chicken parmesan” will really be chicken breaded with Italian breadcrumbs, seasoning and parmesan, baked in the oven. I figure it can’t mess up too badly, right? We’ll have salad with it, pulling out some veggies for the kids to have on their own. Wednesday: Leftover chicken & risotto. Trying to be SO much better about using up our leftovers and not letting them go to waste! We’ll have it with some cooked green beans this time. Thursday: Chicken stir fry – it’s been a while since we’ve done this! We’ll add in zucchini, onion, carrots, and broccoli. YUM! I love that it’s an easy dinner, too. Friday: Hamburgers & french fries. It may be nice enough to use our awesome Weber grill outside, but if not we’ll use our indoor grill that does a pretty great job itself. I also want to roast some garlic in the oven – it is SOOO good smeared on a burger! Saturday: We’ll probably go out for dinner, although I have no clue where. I’ve found that Friday nights we almost always want to stay in because we’re just so tired from the week, but then Saturday we’re often at home so much that getting out for dinner is really nice. What are you eating this week? Any new recipes I should try? As a teenager I always loved trying new beauty products – I had the time to spend on my skin and hair, and I tried all sorts of things. Face masks, hot oil treatments for my hair, and many other items ended up being unofficially tested by me and my friends. Now that I’m older and so much busier, my beauty routine has definitely taken a back seat to everything else. 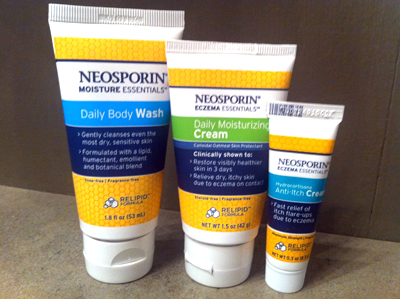 I wash my face morning and nighttime, and if my skin feels rough I use a moisturizer. 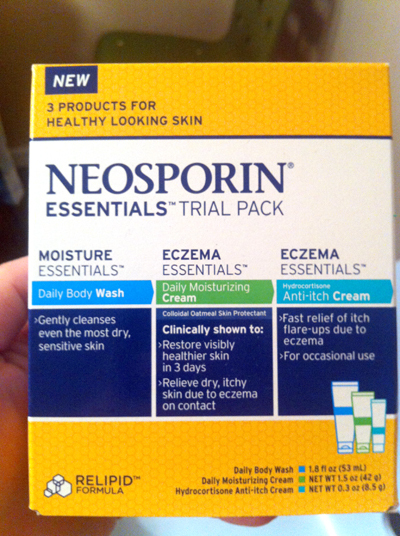 That’s about the extent of my skin care – or at least it has been until now. I recently got selected to participate in a test drive for Meaningful Beauty products, and am looking forward making a conscious effort to take care of my skin. I just turned 30 so it’s definitely on my mind that I want to prevent wrinkles and keep my skin youthful. At this point, I haven’t noticed too many wrinkles. My biggest skin complaint is large pores, which I would love to improve. I will take a before picture to save and post with an after picture, and I’ll share those with you in a few weeks when I talk about my experience with the products. The Meaningful Beauty product line focuses on five steps: cleanse, protect, repair, revitalize, and purify. 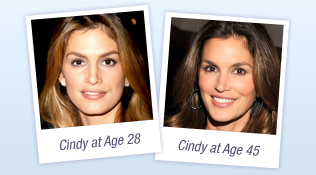 The products were developed by Cindy Crawford and French doctor Dr. Jean-Louis Sebagh. Here are the products I’m getting to try, and descriptions of them from the Meaningful Beauty site. Give your skin a daily dose of anti-aging ingredients to clarify, brighten and even skin tone. This anti-wrinkle crème combines our breakthrough antioxidant complex with a botanical blend that helps hydrate and revitalize skin. Formulated with SPF 20, it’s also designed to shield against UVA/UVB damage. Improve the appearance of puffiness, dark circles and crow’s feet with our Lifting Eye Crème. This unique antioxidant complex helps address the signs of aging while refreshing, soothing and moisturizing tired eyes. Carefully selected botanicals pamper and brighten, so eyes feel tightened and lifted. Dr. Sebagh calls this his “red carpet secret” because it is designed to smooth and condition while encouraging cell renewal to help restore skin’s natural vitality and brightness. Formulated with soy protein, marine botanicals and antioxidants to help nourish, protect and revitalize your complexion, leaving it with a youthful, luminous glow. As a part of participating in this program, I got a second set of products to share with someone meaningful in my life. I decided to give my set to Stephanie, who I’ve been friends with for over four years and is definitely an important person to me. She always makes me laugh and gets my goofy sense of humor, and is an encourager and motivator when I need it most. She also loves a good beauty product as much as I do, so I knew she would really enjoy giving Meaningful Beauty a try (I was right – she’s already said she really likes the set). I’m looking forward to following the morning and night routines (both of which are pretty quick to complete, a vital characteristic to me) and watching for changes over the next few weeks. Be sure and keep an eye out for my follow-up post next month to get my opinions! Note: I wrote this review while participating in a test drive campaign by Mom Central Consulting on behalf Meaningful Beauty and received a 5-step treatment kit to facilitate my review, a second 5-step treatment kit to giveaway, and a promotional item to thank me for taking the time to participate. Once we had kids, we quickly realized how these tiny little people can require an amazingly large amount of stuff. From diapers and wipes to baby food and more, there’s always something they need. I, of course, am always on the hunt for the cheapest prices and best deals. Well, Sam’s Club is making it even easier for moms. Don’t miss out on precious moments by wasting hours at the grocery store and fussing over budgets. Discover an easy way to save on baby essentials from P&G by buying them in bulk at Sam’s Club this month! Purchase all the basics for baby at your local Sam’s Club store to save time and money with a limited-time $10 Gift Card offer. Stock up on P&G products at Sam’s Club in February so you can afford to give your baby quality products AND spend less time hunting for deals! Pretty great, right? So not only can you stock up on products and find great prices… you’re also able to get additional money back in the form of a gift card. I love deals like that. Guess what? Right now I get to host a giveaway for $25 in gift cards to Sam’s Club! One lucky reader will win two gift cards to Sam’s Club that total $25 in value. Perfect to stock up on baby items – or whatever you need! This contest is open to all US residents 18+. Entries will be accepted until the end of the day (midnight Central) Monday, February 27. By entering this giveaway, you agree to the Official Rules. Mandatory Entry: Comment on this post telling answering this question: Which of the participating P&G baby essentials are you most looking forward to stocking up on during the February promotion at Sam’s Club? Note: The information and giveaway for this post have been provided by Sam´s Club and P&G through MyBlogSpark. 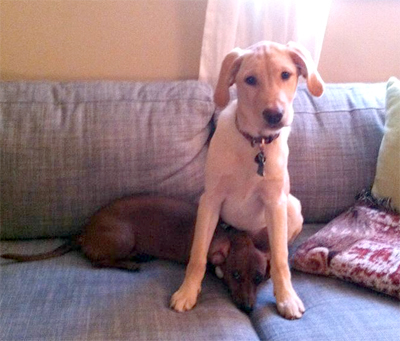 We have two dogs, Sally (our Lab puppy, about 7 months old) and Josie (our miniature dachshund, 7 years old). When we just had Josie, we really didn’t have to buy food very often. A big bag would last us a long time, so shopping for her didn’t really seem like an issue at all. Once Sally joined our family and quickly grew (and grew…and grew…) we started realizing that big dogs = more food. Yup, we’re smart like that. This meant more trips to the store, and more lugging home heavy bags of grub for her. I don’t know why shopping for their food online hadn’t really occurred to us. I’m a big fan of online shopping for lots of things, from gifts to books to diapers. Regardless, we hadn’t ever shopped for the dogs online – until being introduced to Mr.Chewy. I got the chance to review their site, and was really curious to see if the prices would compare to our typical store experience. I think I actually went into the whole experience a little skeptical, wondering if there’d really be savings or if we’d end up paying more in the end. 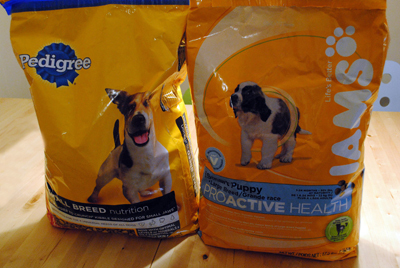 We got Pedigree Small Breed for Josie, and IAMS Proactive Health for Large Breed Puppies for Sally. Sally’s food was $25.99 for a 17.5 pound bag, and Josie’s was $20.99 for a 15.9 pound bag. When I compare those prices to the store we typically shop at, the prices at Mr.Chewy were about $2.00 more for each bag. But, if I signed up for recurring shipments (which can be canceled at any time) I saved an additional 15%, bringing the cost down to less than at the store. I’m not sure how prices on other items compare, but that extra 15% off can really make a difference. 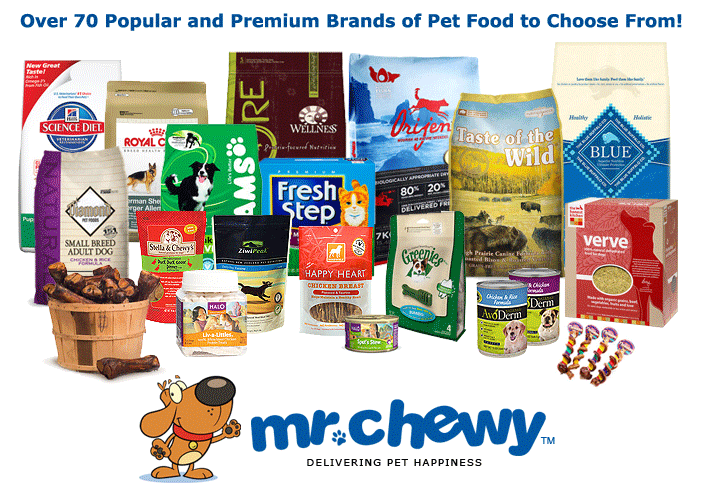 Plus, Mr.Chewy provides free shipping on any order over $49. I scoped it out and that’s a much better deal than a major pet supplier’s site, where they offer $5.99 shipping on orders over $60. I’m a huge fan of Mr.Chewy now and we will definitely be buying dog food and other pet supplies there in the future. With our first order it took less than a week to arrive. The convenience of having the heavy bags delivered right to our door for cheaper than in-store is really appealing! I’d recommend giving their site a try. Note: I received products to facilitate my review. All opinions in this post are honest and are my own. Wow, it’s been a couple of days since I’ve posted! In case you’ve wondered where I’ve disappeared to, it’s off into the depths of prepping our house to sell it – which is not fun, I’ve learned, even before actually listing it. It’s been a lot of work getting it ready. Vanity falling apart, painted white but with dusty rose pink spots showing through various scratches. OLD toilet that shall not be discussed any further. Yes, it was gross. 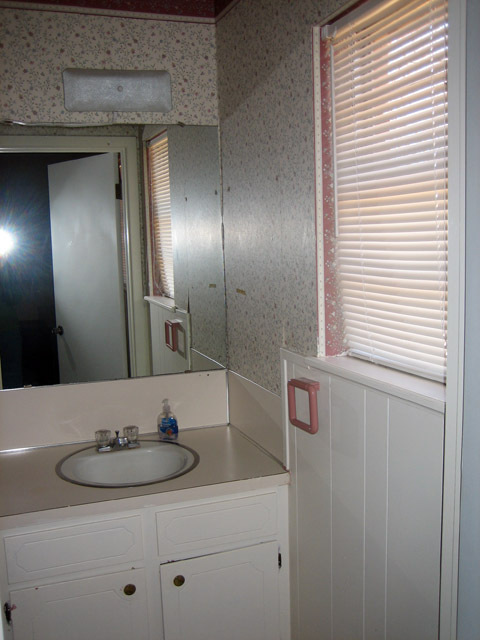 NO outlet, aside from one on the light fixture up high above the mirror held with clips to the wall. Travertine floors – love them! 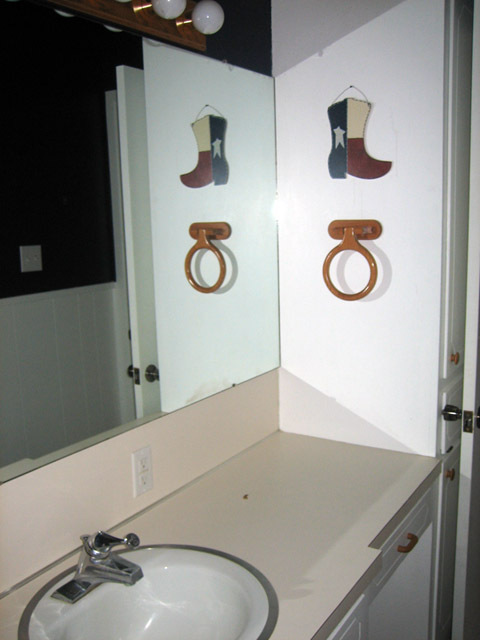 New free-standing vanity with granite counter & undermounted sink. Painted walls and new wainscoting. New shelf and towel racks. I painted, but Brian did the bulk of the work. I am really happy with how it turned out (and thankful for a handy husband)! 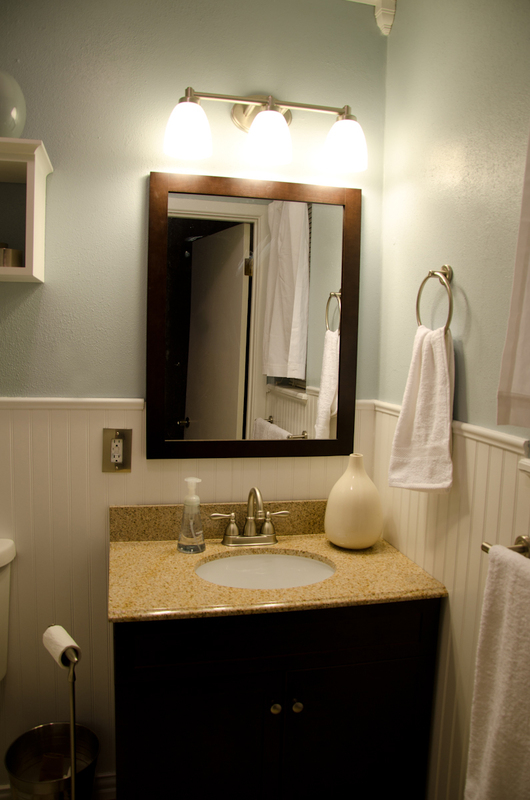 A while back we redid our hall bath, too. It was (yeehaw) Texas themed, and also had carpet. 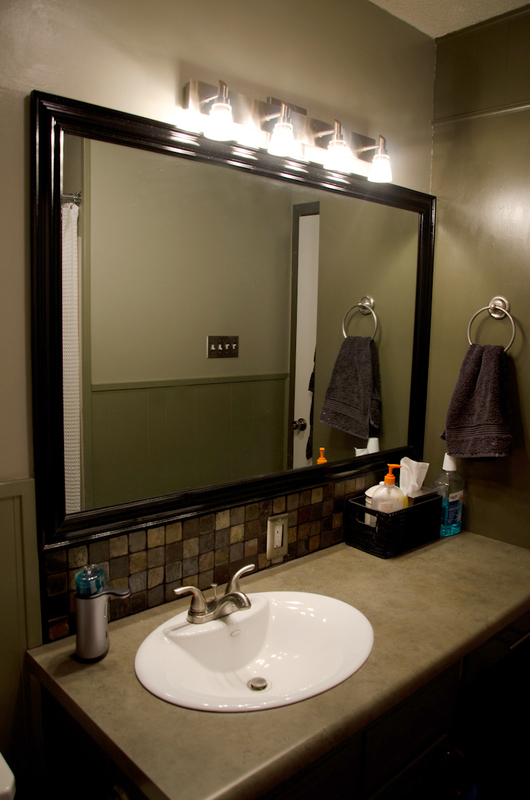 Brian installed a slate floor and backsplash, new counter, hardware, and new sink. And we definitely painted over the navy walls. 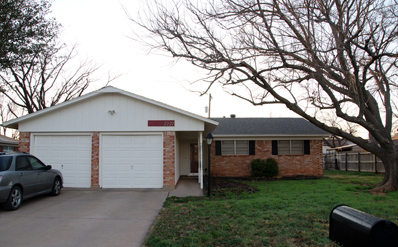 I’m also proud of what we’ve done to the outside of the house – when we bought it the trim didn’t match the garage doors and it drove me nuts. 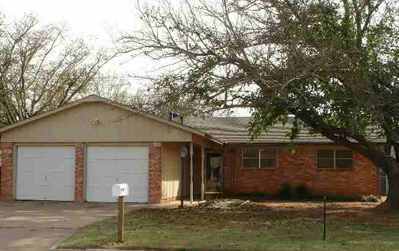 I think a fresh coat (well, 3-5 coats) of white paint and some black shutters made a nice update, don’t you? We also removed some chunky forest green house numbers from the garage (photoshopped out of the picture below) and added a more modern take with brushed nickel numbers on a red board that matches the red of our front door. So anyway, there’s my excuse for being MIA lately, and for – yet again – falling behind with my daily photos! We still have a few projects left to do – it’ll be time to hit up the home improvement stores again! I even found a 10% off + free shipping coupon from Home Depot. Gotta love saving money! 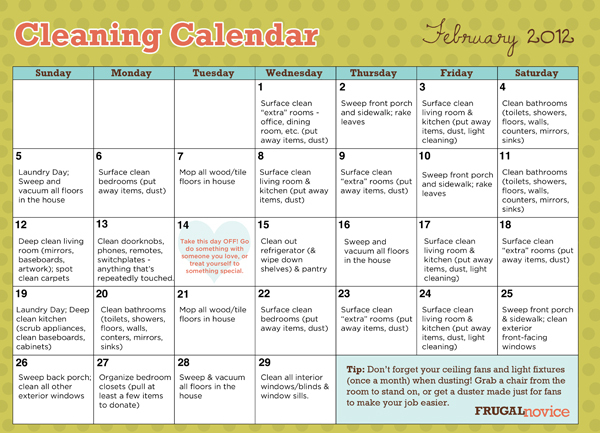 Once our projects are done, it’ll just be a matter of maintaining a clean house. That is sure to be a breeze with two little boys, right?